Your private English-speaking guide will meet you at your cruise port upon your arrival, who will hold your name sign for you to recognize. Begin our sightseeing at Yu Garden, a beautiful southern China classic garden, featuring exquisite layout with rocks, ponds, pavillions, trees and flowers. The Chenghuangmiao Bazza nearby is a good place to hunt for Then visit Shanghai Museum, which is world renowned for its fine collection of a large number of art relics. Move on to the symbolic attraction of the city-the Bund. You will be impressed by the foreign style buildings of the city’s colonial period. Finally let’s come to the premier pedestrian shopping street-Nanjing Road for fun. Continue our sightseeing in this charming city. 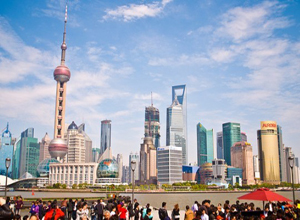 First, visit the other attraction in the ctiy center – Shanghai Urban Planning Exhibition Center, which displays Shanghai’s past, now and future in a fascinating way. Then acend the skycraper Oriental Pearl TV Tower to have a bird’s view of the city. Finally, come to the famed Jade Buddha Temple to find true peach in your heart. The temple is famous for the two delicate jade statues imported from Burma. Be transferred back to your cruise terminal after the tour.